“We like space, I mean, I do, I’m a space freak really.” If a landscape is a spatial experience, then how do you capture it as an artist? The grand canyon is the world greatest hole, thrilling to look down into it, no focus, no centre, no focal point: “The grandeur of it is very difficult to capture.” David Hockney decided to take on the unphotographable, and drove to the Grand Canyon thinking he would make a photographic collage. Once he saw the prints, he was displeased with the result, as they seemed too flat, he explains. That is why he decided to paint it in stead. 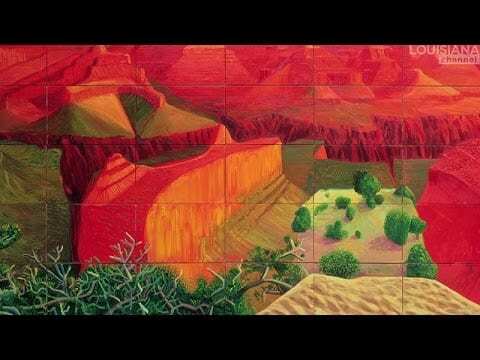 Hockney did two large scale paintings of Grand Canyon, the first one was based on the photographs, while the second one, ‘A Closer Grand Canyon’ seen in this interview, was painted from drawings which he made while staying in a hotel right by the edge of the canyon. Cameras make things distant, Hockney says. He also talks of why he decided to work with small canvases, and the problems of both moving and displaying large works of art. YOU MIGHT ALSO LIKE: ASX.TV: David Hockney - "Pearblossom Highway"
English artist David Hockney, (b.1937) studied at the Royal College of Art where in 1960 he was featured in the exhibition Young Contemporaries that announced the arrival of British Pop art. He was associated with the movement, but his early works display expressionist elements, not dissimilar to some works by Francis Bacon. Hockney has homes in Yorkshire, London and Los Angeles and an office in Hollywood. In the early 1980s, Hockney began to produce photo collages, which he called “joiners,” first using Polaroid prints and subsequently 35mm, commercially-processed color prints. Using Polaroid snaps or lab-prints of a single subject, Hockney arranged a patchwork to make a composite image. Posted in ASX.TV, Painting and tagged David Hockney.